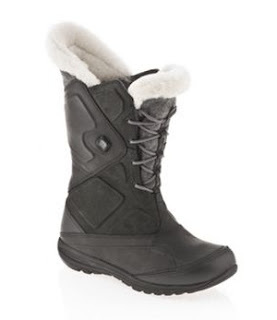 fashionably petite: Columbia Sportswear's Women's Snowfall™ Thermo™ Boot - Must-Have Item for the Season! Columbia Sportswear's Women's Snowfall™ Thermo™ Boot - Must-Have Item for the Season! If you find yourself trudging through snow, ice and slush this winter, especially in 20 degree temperatures, you are going to want to pick up a pair of Columbia Sportswear's Women's Snowfall™ Thermo™ boot. An electric heating system is integrated into the design of the boot! All you have to do is charge up the removable battery on each boot. With just a press of the button , you'll immediately feel your feet warm up. There are three temperature settings - High (Red), Medium (Amber) and Low (Green). The Snowfall™ Thermo™ incorporates Omni-Heat® breakthrough thermal technology that helps maintain warmth and prevent heat loss, keeping you comfortable in cold weather. Omni-Heat® ensures you stay warm and comfortable in the most extreme cold conditions. The thermo reflective lining actually provides 20% more warmth by reflecting heat back off of the reflective surface and off the space in between, allowing moisture to be wicked away and evaporate. I found the boot to be stiff at first, similar to a ski boot feel. I easily adapted to wearing them though, especially in the snow. I feel like I can walk around the city all day and night in the Snowfall™ Thermo™ boots! Wearing them made it very easy to clean the snow off of my car without my feet getting cold and they also have a great grip when walking on ice. You definitely should wear a thick sock, and one that isn't going to slide off your foot as you walk. If you don't wear a thick sock you run the risk of your ankle rubbing against the boot, which may hurt or feel uncomfortable. I also tried wearing the boot over leg warmers and that kept me comfortable and warm. I absolutely recommend these boots, and plan on wearing them throughout winter. Even if there's not really snow on the ground I prefer to wear them to keep my feet warm in frigid weather. I have received some great comments on them already. Some people have approached me on the street and in stores about the buttons on the boots lighting up. They are really amazed when I tell them they are heated boots! You can get the Snowfall™ Thermo™ at columbia.com. hi I bought a pair of them but I'd like to know how can I clean them thank you!! !